I was recently commissioned to make a wedding card and so my thoughts immediately turned to hearts, white on white, flowers and all the usual suspects. So I was quite taken aback when I asked "is there anything particular you would like on the card?" and the response was "Yes, a starfish"! 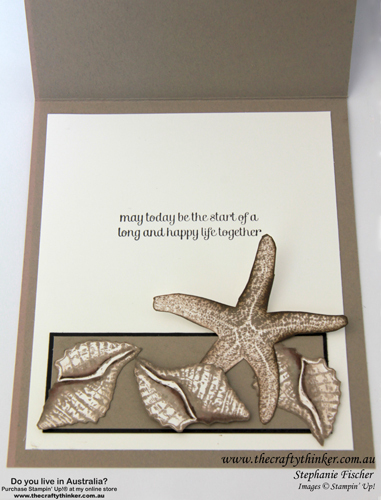 It all made complete sense, once I discovered that it's for a beach wedding and there was a starfish on the invitation! 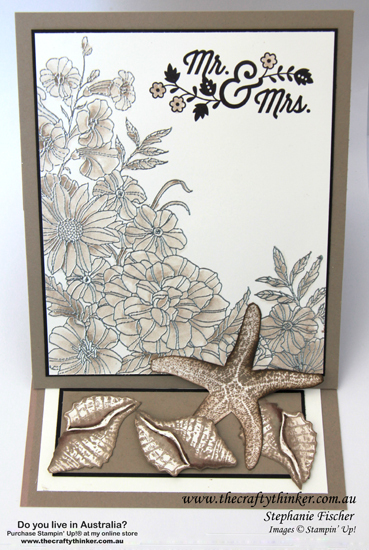 However, I found it challenging to think of a way to make a starfish romantic or wedding-y, so eventually I decided to add tropical-looking flowers! So where is the starfish? !! Sadly three of the four stamp sets that I used will be retired on 31st May, so if you like them - jump in quick to buy them before they're all sold out! You can click here to shop for retiring items, some of which are discounted by as much as 50%! I made the easel card from Crumb Cake cardstock. It's not quite a square card, measuring 5" across and 6" high (when closed). To achieve this, I cut a 12" x 5" piece of cardstock and scored the long side at 6" and 9". I also cut a piece 6" x 5" for the front of the card. For folding and gluing instructions, please see the foot of this post. Line up the front of the card and adhere it to the glued panel. I heat embossed the Corner Garden stamp in silver onto Whisper White cardstock and then watercoloured it with Crumb Cake ink. Then I trimmed the panel to size and added a Basic Black mat 1/8" larger and adhered that to the front of the card. 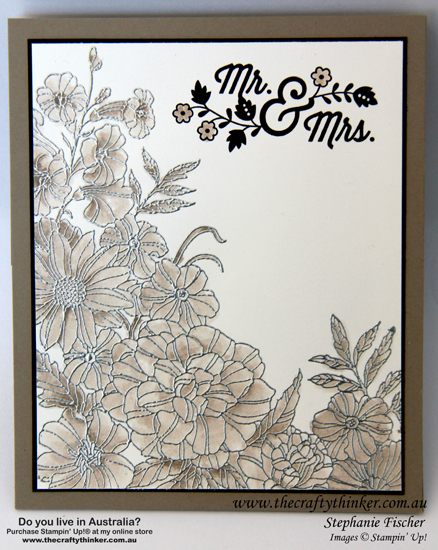 I added the sentiment from the For the New Two set using Basic Black ink and watercoloured the little flowers with Crumb Cake ink. I stamped the starfish (from Picture Perfect - the only set is continuing into the new Annual Catalogue) in Crumb Cake, fussy cut it and sponged the edges with Crumb Cake and Early Espresso. The shells from the By the Tide stamp set received similar treatment - I also reinforced the shading by watercolouring with Early Espresso ink. I only glued the front two legs of the starfish into place and added a dimensional towards the centre of the creature to encourage the remaining three legs to support the easel when the card is open.... a very obliging starfish! The sentiment inside is also from the For the New Two set.